The Sandals Foundation, the non-profit arm of Sandals Resorts International, has unveiled a new collaboration with Scholastic Book Fairs aimed at improving literacy among students in the Caribbean. Scholastic made the announcement at the Social Media On the Sand event at the Beaches Turks & Caicos Resort Villages & Spa. Scholastic Book Fairs, a division of Scholastic that hosts more than 130,000 book-sale events in schools annually, will sponsor Reading Road Trip, the Sandals Foundation’s educational outreach program operated by Island Routes Caribbean Adventure Tours. The weekly program affords guests of Sandals and Beaches Resorts the opportunity to visit a Sandals Foundation supported school throughout the Caribbean to lend literacy, comprehension and vocabulary support and give books to students throughout the school year. “Scholastic is one of the most vibrant organizations instilling passion for reading among children in the world today,” said Heidi Clarke, Director of Programs for the Sandals Foundation. “We are thrilled to be working with them and to have them as our partner here in the Caribbean,” she concluded. 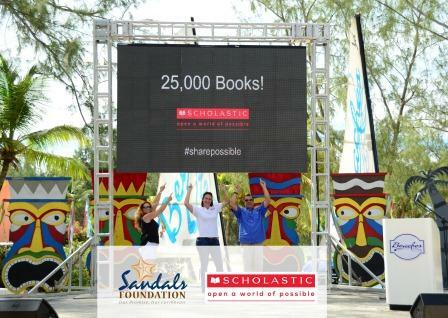 To help ensure young students throughout the Caribbean have access to great books, Scholastic Book Fairs, through the Scholastic Possible Fund, will donate 25,000 books to be utilized by local schools in Jamaica, Antigua, St Lucia, The Bahamas, The Turks & Caicos Islands, Grenada, and Barbados which the Sandals Foundation supports. Scholastic will also provide Caribbean students and educators with a one-year subscription to Scholastic’s BookFlix program, an online interactive literacy resource that helps reinforce reading skills by pairing classic fictional video storybooks with nonfiction e-books from Scholastic. “We are delighted to be able to join with Sandals Foundation to provide much-needed books and other literacy resources to thousands of students at schools throughout the Caribbean,” said Dillon Kalkhurst, Director of Community Engagement and Strategic Partnerships for Scholastic Book Fairs.